This guide is designed to help your health center successfully collect SO/GI data, no matter where you are in the process. For those just beginning, the guide can be used from start to finish. If you have already created a system, but have encountered challenges and questions, this guide can help you address them. Even if your system is working smoothly, you will find resources and recommendations here that will help you move to the next level of data collection and analysis. Faculty: Chris Grasso, MPH, Associate Director of Informatics and Data Services, Fenway Health and Dr. Alex Keuroghlian, MD, MPH, Director of the Division Education and Training at the Fenway Institute. With the first year of SOGI reporting behind us, and results returned to health centers, we are excited to bring you a one-and-a-half-hour update on SOGI reporting. Dr. Keuroghlian and Ms. Grasso will use the first hour to present on the previous year of SOGI data collection, what we have learned and how to procede. They will then be available for 30 minutes to answer any questions about the data collection process, implementing forms, data results and other remaining questions from the first year of collection. As part of SO/GI Office Hours, we invite you to submit questions in advance of the session. Dr. Keuroghlian and Ms. Grasso will review the submissions in an effort to group similar questions together and gauge what kinds of questions are most relevant for health centers. Participants will also have the opportunity to type in questions live during office hours. There is a common misconception that few or no lesbian, gay, bisexual, and transgender (LGBT) people exist within the farmworker community. As a result, the health care needs of LGBT farmworkers are often overlooked. This webinar will address the unique challenges faced by LGBT farmworkers, including invisibility, cultural and religious taboos, and fear of job termination or harassment, to ensure that health care providers are able to provide quality care to this highly vulnerable population. Alexis Guild a senior health policy analyst from Farmworker Justice will provide an overview of Farmworkers in the US and the unique laws and regulations that can affect health care, and Carlos Casteñada, the Community Outreach Coordinator at Adelante Healthcare, will share his experiences of working with LGBT people in the field and making outreach workers at Adelante Healthcare accessible as a resource for LGBT people. LGBT people face stigma and related health disparities in healthcare. In spite of the advancements in LGBT acceptance and policy, many LGBT people remain largely invisible to their primary care providers. 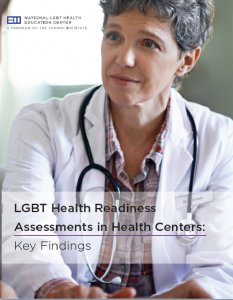 In order to address these disparities, new requirements included in the 2016 Uniform Data System require health centers to collect and report sexual orientation (SO) and gender identity (GI). Collecting SO/GI data of new and returning primary care patients is critical for health centers to provide a welcoming, inclusive environment. Routine SO/GI data collection in the EHR can be used to improve care, and measure and track health outcomes at the individual and population levels. Systems that support collection of SO/GI data support improved quality of care, timely clinical information, and improved communication among patients and care teams. In this webinar, two health centers will share their experiences implementing changes within the EHR, revising workflows, and training clinical and non-clinical staff to successfully implement SO/GI data collection and create an LGBT inclusive environment in primary care. Lesbian, gay, bisexual, and transgender (LGBT) people face many health disparities and stigma in health care. Despite this, LGBT people remain largely invisible to their providers. 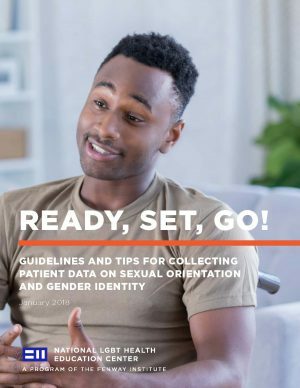 Collecting sexual orientation and gender identity (SO/GI) data of new and returning patients is critical for health centers and other health care organizations to provide a welcoming, inclusive environment of care; and to provide high-quality care to all patients. This webinar will teach participants how to recognize and address SO/GI data issues from the electronic health record. Chris Grasso, Associate Director of Director for Informatics & Data Services at the Fenway Institute will share her experience with data quality checks at Fenway Health. At the end of the session, participants will have the tools to monitor SO/GI data collected from their own EHRs. 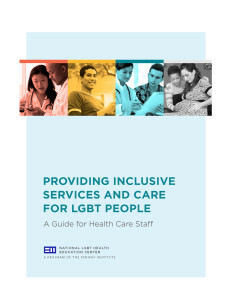 A 2014 publication by The Joint Commission, offering strategies for U.S. hospitals to create more welcoming and effective health care environments for LGBT patients. The guide also includes practice examples, resources, and testimonials. Produced in 2011 by the Global Forum on MSM & HIV, this publication includes a glossary of terms, roles and responsibilities of health care providers, a framework for understanding homosexuality as an identity, not a mental disorder, and an overview of MSM health needs and issues. The piece draws connections between homophobia and HIV risk, and lays out principles for effective care for MSM. 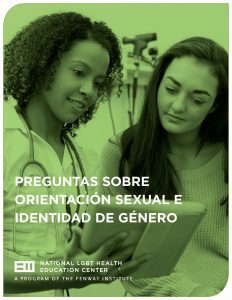 A publication by the Gay & Lesbian Medical Association (GLMA), including information on creating a welcoming environment for LGBT patients, and addressing the unique medical needs of lesbian and bisexual women, and gay and bisexual men. Topics include confidentiality, language, and intake forms. Includes outside resources. 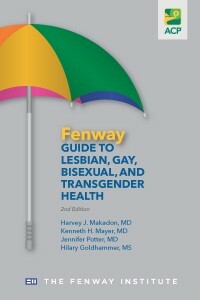 This 2012 publication, put out by The Fenway Institute, includes basic information about the LGBT population, LGBT health disparities, and how to incorporate LGBT health care into medical centers, hospitals, and community health centers. 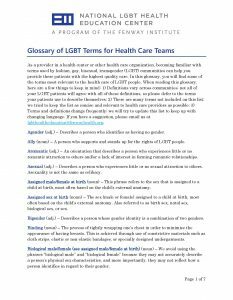 The GLBT Health Access Project’s online collection of materials, including access to posters and stickers that foster safe and welcoming spaces for LGBT patients, and generally combat homophobia in health care. A 2010 journal article written by Theresa L. Garnero, APRN, BC-ADM, MSN, CDE, summarizing key concepts behind providing culturally competent diabetes care for LGBT patients. The article includes tools to help providers provide this care. Hosted by the Human Rights Campaign, this webpage offers examples of patient non-discrimination policies that address matters of sexual orientation and gender identity. Examples include policies adopted by Faulkner Hospital (Boston), Group Health Central Hospital (Seattle), Rush University (Chicago), among others. A tool created by the National Center for Cultural Competence, intended to improve cultural competence, and to allow personnel to assess their own values, attitudes, and practices with the goal of motivating improvement. 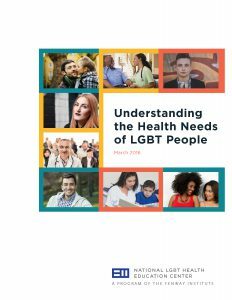 A publication put out by the Substance Abuse and Mental Health Services Administration (SAMHSA), exploring significant health issues faced by lesbians, gay men, bisexual men and women, and transgender people. This also includes a discussion of gender identity, PowerPoint slides on these top health issues, and outside, web-based resources for further exploration. The National LGBT Health Education Center’s collection of webinars and video training on topics including transgender health, LGBT youth, LGBT older adults, LGBT people of color, LGBT families, HIV/STI treatment and prevention, behavioral health, collecting sexual orientation and gender identity data, cancer and LGBT people, organizational change, and other issues in primary care. These webinars include downloadable content and include free CME/CEU credit. Featuring interactive presentations, slideshows, and evaluation surveys, the National LGBT Health Education Center’s learning modules offer information and instruction on health equity, transgender health, LGBT youth, LGBT older adults, and HIV screening, treatment, and prevention. This website, created by the LGBT Issues Committee of the Group for the Advancement of Psychiatry, offers a series of modules around working with LGBT patients in a psychiatric setting. The modules include links, resource lists, and references for further exploration. Offered through the American Medical Student Association (AMSA), this website provides a series of pre-packaged event/training materials on LGBT health for faculty physicians and medical students to bring to medical schools. These projects-in-a-box include instructions, power point presentations, video clip suggestions, and handouts. Topics include Queer People of Color, Transgender Health, and Heterosexual Allies. Information on LGBT cultural competence training available to interested organizations, universities, and healthcare facilities, and provided by the National LGBT Cancer Network. A series of trainings related to gender, sexuality, and issues relevant to the LGBT community. Trained organizations receive Safe Zone stickers that can be displayed around the building to communicate their commitment to creating an LGBT-inclusive environment. Created by the Centers for Disease Control and Prevention (CDC), this online PDF guide offers tips for creating dialogue around sexual health issues, including a sexual history. The goal of the guide is to help providers determine STD risk among patients, and to determine how best to perform testing. On online video published by the American Medical Association (AMA), intended to help physicians take a more thorough sexual history and respond to patients’ needs accordingly. The video emphasizes the pressing need for open and respectful communication between doctors and patients around sexuality. Published by the Mountain Plains AIDS Education and Training Center as part of their HIV Provider Reference Series, this online PDF quick reference guide highlights strategies for HIV risk assessment, risk reduction, and HIV prevention, including sample questions to ask patients around sexual history, and general tips for dialogue, as well as resulting action. A 2002 article promoting the collection of patients’ sexual history by clinicians, arguing that such practices could decrease high-risk sexual behaviors among patients. Click on links below to skip to videos! Marcus: This video shows two interactions in which a patient, Marcus, is asked about his sexual history. One interaction is positive and one is negative. Zoe: This video depicts a patient, Zoe, who expresses interest in starting a family. The doctor asks some open-ended questions and also recommends a Pap test. Hunter: This video demonstrates a positive interaction between a doctor and a patient who is questioning their gender identity. It includes a conversation on non-binary gender identity. Yousef: This video demonstrates one way for a staff member to intervene when they overhear a colleague make an inappropriate remark about a transgender-identified patient. Luis: This video demonstrates two interactions between a patient and registration staff, one positive and one negative. 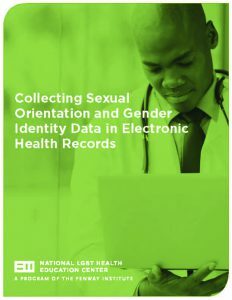 Sexual Orientation and Gender Identity Data Collection Video 1 from National LGBT Health Education on Vimeo. 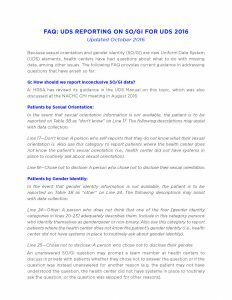 Sexual Orientation and Gender Identity Data Collection Video 2 from National LGBT Health Education on Vimeo. Sexual Orientation and Gender Identity Data Collection Video 3 from National LGBT Health Education on Vimeo. Sexual Orientation and Gender Identity Data Collection Video 4 from National LGBT Health Education on Vimeo. Sexual Orientation and Gender Identity Data Collection Video 5 from National LGBT Health Education on Vimeo. Sexual Orientation and Gender Identity Data Collection Video 6.1 from National LGBT Health Education on Vimeo. Sexual Orientation and Gender Identity Data Collection Video 7 from National LGBT Health Education on Vimeo. Marcus from National LGBT Health Education on Vimeo. Zoe from National LGBT Health Education on Vimeo. Hunter from National LGBT Health Education on Vimeo. Yousef from National LGBT Health Education on Vimeo. This video demonstrates two interactions between a patient and registration staff, one positive and one negative. Luis from National LGBT Health Education on Vimeo. SO/GI Office hours is part of our on-going training offerings working with health centers to prepare them to collect Sexual Orientation and Gender Identity (SO/GI) in Electronic Health Records. SO/GI Office Hours are 90-minute sessions with Alex Keuroghlian, MD, MPH, Director of Education and Training Programs at the Fenway Institute, and Chris Grasso, MPH, Associate Director of Informatics and Data Services, Fenway Health. Dr. Keuroghlian and Ms. Grasso will be available to answer questions, detail recommended practices, and describe strategies for adding SO/GI questions to registration documents, integration into EHRs, and appropriate staff training on how to collect the data. We strongly recommend watching our webinar “Do Ask, Do Tell! Collecting Data on Sexual Orientation and Gender Identity in Health Centers” before participating in office hours. This webinar covers the barriers to care that many LGBT people face, describes inequities in health outcomes for LGBT people, and details both how and why to collect SO/GI data in electronic health records. It is available live and on-demand and provides free CME/CEU credit. SO/GI Office Hours: May 2016 from National LGBT Health Education on Vimeo. SO/GI Office Hours: August 2016 from National LGBT Health Education on Vimeo. With the first year of SOGI reporting behind us, and results returned to health centers, we are excited to bring you a one-and-a-half-hour update on SOGI reporting. Dr. Keuroghlian and Ms. Grasso used the first hour to present on the previous year of SOGI data collection, what we have learned and how to procede. They spent the remaining time answering questions about the data collection process, implementing forms, data results and other remaining questions from the first year of collection.